What do the nation of Japan, the state of Tennessee, and the city of Moscow have in common with Russian nuclear physicist Yuri Oganessian? If you hadn't guessed, all four just had elements named after them, marking the observation and naming of all elements in the seventh row of the periodic table.Nihonium, moscovium, tennessine, and oganesson are the latest additions to the chart, assigned to elements with atomic number 113, 115, 117, and 118 respectively. Atomic number refers to the number of protons in each atom's nucleus, and correspondingly to the number of electrons that orbit the protons and neutrons. 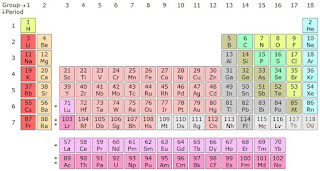 It is the number of electrons that primarily determines an element's physical properties.